Labyrinth Society: The Versailles Vendetta When 12 year-old Mia Cornell is sent to live at the Tarpley Estate, her ninth foster home, she has no idea what she's in for. Having a kind but mysterious foster mother and three quirky foster sisters is all well and good. Discovering that her new family is a secret society—they use a portal in their garden labyrinth to travel the globe seeking lost art, artifacts, and OSOs (objects of supernatural origin)—is something else entirely. Mia barely has time to wrap her head around the truth when the Society's latest job, tracking down Marie Antoinette's necklace, goes sideways. Mia and her new siblings—Tomi, the historian; Devon, the hacker; and Lily, the muscle—must use their wits, plus a few cool OSOs filched from the Society's vault, to stay a step ahead of a sinister enemy from their foster mother's past. But just how far back does Mrs. Tarpley's past go? And will Mia stand by her new family or cut and run when they need her the most? Author Biography: Angie Kelly is the pseudonym of a former member of the Labyrinth Society. When she’s not writing about her adventures, or reading about other people’s adventures, she’s busy traveling the world and indulging her inner twelve year-old. Although she was last sighted lurking around the British Museum after hours, her current whereabouts are unknown. Blast Giveaway $100 Amazon Gift Card or Paypal Cash Ends 6/23/14 Open only to those who can legally enter, receive and use an Amazon.com Gift Code or Paypal Cash. Winning Entry will be verified prior to prize being awarded. No purchase necessary. You must be 18 or older to enter or have your parent enter for you. The winner will be chosen by rafflecopter and announced here as well as emailed and will have 48 hours to respond or a new winner will be chosen. This giveaway is in no way associated with Facebook, Twitter, Rafflecopter or any other entity unless otherwise specified. The number of eligible entries received determines the odds of winning. Giveaway was organized by Kathy from I Am A Reader, Not A Writer and sponsored by the author. Does your sewing machine come with lots of fancy stitches that you've never thought to try? This essential guide to machine and hand stitches will teach you how to use any and every stitch for professional-looking seams, hems, gathers, darts, and more. Unlock your full sewing potential with 57 machine stitches, 18 hand stitches, and tips to choose the correct needles, threads, and sewing machine accessories, complete with detailed step-by-step tutorials and illustrations. This comprehensive stitch dictionary is a must-have companion for any sewer, whether you just bought your first sewing machine or you’re a seasoned expert looking to polish your skills. If your passion is dressmaking, tailoring, or simply mending your own clothes, Super Stitches Sewing gives you all of the information you need to make every project a success. NICOLE VASBINDER has taught thousands of people the joy of sewing in classes throughout the San Francisco Bay Area. When she is not teaching sewing and design classes at her store, StitchCraft, in Petaluma, California, she designs Queen Puff Puff handbags and accessories. 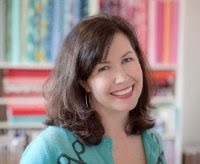 Nicole is the author of Sewing Machine Secrets and Sewing Solutions, and has contributed projects to many books and magazines including Vintage Craft Workshop and Button It Up. I have sewn for many years, starting back as a young child and using a treadle sewing machine, sure wish I had that now. I have recently taken the hobby back up and have ventured into quilting, and all the gadgets that go with it, including lots of material. After all, I really didn’t have any stash when I started, now I do, and can’t seem to stop. 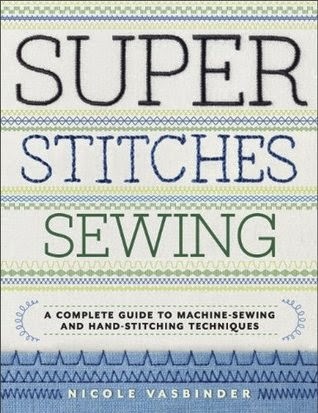 Have recently received a copy of Super Stitches Sewing, and I am in love with this book. After stabbing in the dark about the feet that came with my used sewing machine, I now have a bible to show me what does what, and how to use them. Because my interest in quilting keeps expanding, there are so many techniques; I now have a way of finding the stitches that I want to do by hand. I’m ready to do some of the appliques, and fancy stitching. I’m even hoping to do hand quilting, and seeing this give me the confidence that I can! You name it, and I can probably find it here in this great find. Which needle shall I use for which fabric? It gives me the information I need, how about the right thread, yes! Also the illustrations are amazing, no more fumbling around for the answers I need. Even the index is great, all the different pages where I can find what I need. This book won’t be going in my bookcase, nope, it will sit right beside my machine for a very handy reference. Just wish I had found this sooner! I received this book through Blogging For Books Program, and was not required to give a positive review. Open Door Marriage, A chance encounter lands NBA star Dallas Avery back in the arms of the woman of his dreams. A woman he hasn’t seen in years. A woman he soon discovers just so happens to be his fi ancée’s aunt! But Dallas’ fi ancee, Tori, isn’t ready to give up all that she’s worked for, so she makes him a shocking offer – go through with the wedding and she’ll still allow him to be with the one woman he now can’t seem to do without. Dallas will get a family, something her much older aunt, Alicia can’t give him. Tori will get the lifestyle she clamors. And Alicia will get the love she’s longed for all her life. Everyone will get a little of what they want. . . and maybe a whole lot of what they don’t. The words still didn’t register, even though this had to be Tori’s fifth time saying them. She glared at her fiancé, still desperately trying to come to terms with the information her mother had blasted to everyone at the packed Thanksgiving dinner table. 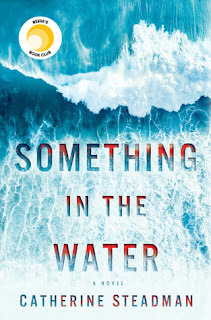 In Strict Confidence, Fans of John Grisham and Mary Higgins Clark will love this suspenseful rollercoaster ride that doesn’t let up until the very end… Psychiatrist Allen Kline is forced to make the agonizing choice of life over death when a killer approaches him with the horrific news that he has abducted Allen's two sons. Who the killer is and why he has chosen Allen to victimize is a question the doctor struggles to answer. What he discovers just may haunt him forever. Things aren’t always what they seem… Detective Ben McCallum is on a mission. Someone is viciously murdering little boys and Ben knows the pain all too well. His son was one of the victims and now, it’s up to Ben to bring the killer to justice . . . before two more young boys die. As Ben struggles to put aside his personal demons to track a killer hellbent on revenge, he’ll discover the killer’s motives hit close to home and everyone will discover things aren’t always what they seem. In Strict Confidence is an intense, harrowing tale that will shock, surprise and satisfy readers with each suspenseful word and doesn’t let up until the very last page. Pump Up Your Book is pleased to bring you Ken Malovos’ Contempt of Court virtual book tour May 5-27! Sacramento trial lawyer, Mike Zorich, is finally coming to grips with the death of his wife from cancer five years ago. There is a new woman in his life. His son is making his way in the business world. His law practice is going well. And he has a new case that promises to be very demanding. Members of the Darnoff wine family are at odds with each other, amidst a divorce and partnership dissolution. Then things go wrong. Mike becomes the target of some unexplained personal attacks. He is mugged on the bike trail and his house is ransacked. Is it someone connected to the Darnoff case? Is it an old client from his years in the Public Defender’s Office? Is it some disgruntled witness from a trial? To top it off, Mike is held in contempt of court and remanded to jail. The attacks continue and only get worse. The authorities don’t have a clue. Can Mike figure it all out before someone is killed? Ken Malovos is a mediator and arbitrator in Sacramento, CA. Previously, he was a trial lawyer, a public defender for 12 years and a business litigator for 25 years. He is a graduate of Stanford University (philosophy) and UC Hastings College of the Law. Ken is a past president of the Sacramento County Bar Association and Legal Services of Northern California. He is a panel member for the American Arbitration Association, a fellow in the College of Commercial Arbitrators, a member of the National Academy of Distinguished Neutrals and a member of the California Academy of Distinguished Neutrals. Contempt of Court is his first novel. He lives in Sacramento with his wife. You can visit Ken Malovos’ website at www.malovoslaw.com. Contempt of Court is a fast pace, riveting book that will keep you up late and page turning, to find the answers. Mike Zorich is a respected and hard working attorney, with some really big cases on his plate. He is finally, although still hurting, over the death of his wife five years ago. His son is doing well, and he is in a new relationship with Nancy, only he is having a hard time committing to her. All of a sudden out of nowhere he is beat up, while he is out jogging. Snide remarks are made to him, but he his having a hard time coming up with answers as to why this guy wanted to hurt him. He is working on high profile partnership dissolution, are they responsible? After the first incident, one after another things begin to go wrong, and people are getting hurt. He needs answers, and fast. Oh what a tangled web we weave, as the old saying goes, and you will wonder how things can get any worse, when the Judge isn’t upholding even the law? Can he find the answers before someone is killed, you won’t see what is coming, and you will be searching for answers to who. You think you will know who is responsible, but you will soon be second guessing yourself. I hated the injustice that goes on, how? Why? Yes the answers are here, but you will have to get to them. Enjoy! I received this book through Pump Up Your Book Virtual Book Tours, and was not required to give a positive review. Pump Up Your Book is pleased to bring you Richard Hacker’s Chain Reaction virtual book tour May 5-30! When Nick and his partner in love and business, Theresa, take a client caught in a grudge between competitive bass fisherman, they soon discover he has unknowingly entangled himself in a plot by healthcare magnate, Bruce Reynolds, to take over Texas and secede from the Union. Hoping to pass the case to the Texas Rangers, Nick is instead recruited to head the Governor’s special task force. He learns Governor Fran Adamson’s major campaign contributor and secret lover, Reynolds, has a plan to resurrect the Republic of Texas. Faced with Reynolds’ hit woman killing enemies of the Republic and a remotely controlled drone air force destroying strategic targets across the state, Nick and Theresa make a desperate attempt to prevent civil war, the destruction of the Governor’s political career, and Dillon’s murder, while keeping their love intact. In his scheme for glory, Bruce Reynolds didn’t plan on Nick Sibelius, who wants the wannabe secessionist to know, when he says don’t screw with Texas, he damned well means it. Richard Hacker is the author of CHAIN REACTION, the third installment in the Nick Sibelius crime series. Champagne Books released DIRTY WATER, the next novel in the Nick Sibelius series after TOXIC RELATIONSHIP, in June, 2013. His first novel, TOXIC RELATIONSHIP, released August, 2012 by Champagne Books was a 2011 Writer’s League of Texas (WLT) finalist, where in addition, SHAPER EMERGENCE won best novel in the Science Fiction category. He is a member of the Pacific Northwest Writers Association. You can visit Richard’s website at www.richardhacker.com. Richard Hacker is giving away (2) 3 ebook sets of his Nick Sibelius series! Two winners will be chosen via Rafflecopter. This giveaway begins May 5 and ends May 31. Winner will be contacted via email on Monday, June 2. I have read several of Lorna Seilstad’s books, and they just keep getting better and better. 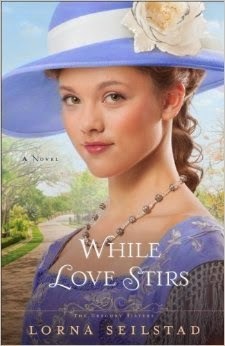 The title of this book is a real play on word; with the main character a graduate of Fanny Farmer’s Cooking School, and that would be Charlotte Gregory, whom we met in When Love Calls. Now don’t worry if you haven’t read the first book in this series, you can get caught up really quick in this book, but don’t deprive yourself of another great book. With this book we find a young woman trying to make her way in a man’s world. She even wants to help at hospitals get patients back on their feet with more nutritious meals. Loved the way she also included flowers, and arrangements to entice their appetites. We also have a young doctor, who is making his way in taking charge at the local hospital. Somehow the tools he needs in his business, microscopes, are not the priority, and the allotted funds are missing? He has also been burned in the romance area, by a cheating fiancé. Put these two type A personalities together, and you guessed it, a lot of bickering. There is also another young man in the picture here. Lewis, a sweet talented young man, who has a passion for Charlotte, he seems to be there and anticipates her needs, but can he capture her heart? You will really chuckle at some of the antics here, I never wanted it to end, and with one more sister in the family, I hope we will have another book. I received this book through the Revell Book Blogger Tour, and was not required to give a positive review. Pump Up Your Book is pleased to bring you Jermaine Gadson’s Tactics, Trends, & Traits of the Enemy book blitz May 19-30! § By entering the giveaway, you are confirming you are at least 18 years old. § This giveaway begins May 19 and ends on May 31, 2014. § Winners will be contacted via email on June 2, 2014. § Winner has 72 hours to reply. In her new novel, All My Belongings, Cynthia Ruchti weaves a heart-wrenching tale of forgiveness, grace, and learning what it means to truly belong. 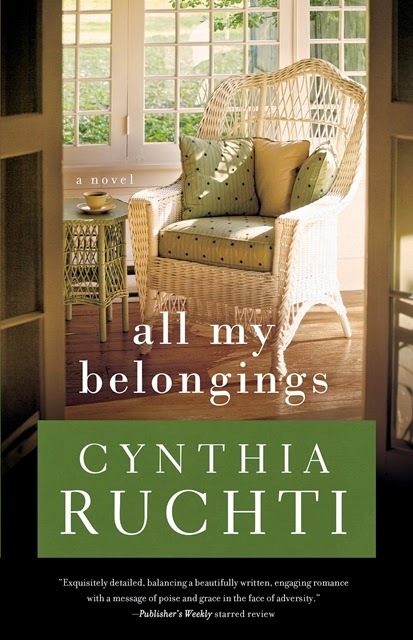 "I was blown away by the beautiful style of Cynthia Ruchti's novel, All My Belongings. Her story was warm, tear-jerking, and beautiful with healing." "There are a lot of good writers on the planet today, but few great ones. Ruchti qualifies as one of the latter. As she skillfully pens a tale of a young woman fighting to overcome her father's legacy, Ruchti keeps readers on the edge of their seats even as we are challenged to consider our own faith and courage in the face of overwhelming odds." Cynthia Ruchti tells stories of Hope-that-glows-in-the-dark through her novels and novellas, nonfiction projects, speaking events and a history of 33 years of on-air storytelling through The Heartbeat of the Home radio broadcast. Her books have been recognized by Retailers' Choice, RT Reviewers' Choice, Family Fiction Readers' Choice, ACFW's Carol Award nomination, and other honors. All My Belongings is her eighth release (including three non-fiction books). Ruchti has also written articles for numerous magazines and industry publications and currently serves as Professional Relations Liaison for American Christian Fiction Writers. Ruchti lives in Wisconsin where she spends her days diving into words, worship, and wonder. It is her delight to serve on her church's worship team and creative arts team. One of her greatest joys is helping other writers grow in their craft. Cynthia and her husband have been married for 40-plus years and have three grown children and five grandchildren. Learn more about Cynthia Ruchti and her books at www.cynthiaruchti.com. As this book opens you are going to feel your heart bleeding for Jayne Dennagee, a girl who has never felt wanted by her parents, and now is fleeing her past. How would you like to be Jack Kervorkian’s daughter that is how Jayne feels, and she is responsible for bringing her father to justice? Jayne does have one bright light in her life, Geneva Larkin who to me turned out to be a substitute Mother, one she desperately needed. Through her, and a lot of courage and help from God, she travels to California to hopefully take a job caring for Auerila, Geneva’s sister. Jayne is now Becca Morrow, and she wants to shed her whole identity of being Jayne, and any link to her father. What a caring and loving person Becca is, you’ll enjoy her relationship with Aurila, and of course Isaac Hughes. Isaac had reservations about Becca taking care of his mother, but when Aurila immediately accepted her, it will make you chuckle, his fears vanished. Life becomes rather nice and safe, and you feel hopeful that she is finally in a secure and loving environment, that is when things begin to change. How was it possible that now Becca is a person of interest in the death of her elderly, and very sick charge, Aurila? Come along and find out what happens to Becca and Isaac, will her past catch up with her, sure looks like it. While I couldn’t stop reading, a real page-turner, I felt like the book ended, and then picked up again. Yes, I enjoyed the rest of the read, but was wondering where we were going, and I kept reading, with some very big surprises and changes that kept happening, sure glad I kept going! Enjoy!